Oh, the dreaded day job. When will you ever break free from it so you can dedicate your time to your creative expression? There are many ways to support your creative work. And sometimes, the work you do as an artist will become self-sustaining. But this is not a reality enjoyed by every creative. The goal, then, should be to become aware of the options available and move in the direction you feel led to. 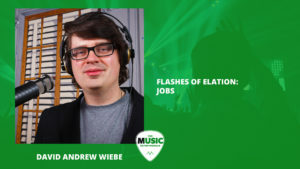 In this episode of The New Music Industry Podcast, I read from my upcoming book, Flashes of Elation, and dig deeper into the world of jobs. In recent episodes of the podcast, we’ve been looking at my upcoming book, Flashes of Elation. Where my first book, The New Music Industry was about “the what” and “the how” of the music industry, how it’s set up, what it looks like, how to thrive and survive in today’s musical climate, Flashes of Elation is a book about “the why.” What is your purpose? Why do you want to be a creative or musician? What drives you? What motivates you? What inspires you to keep going when things are tough. And rest assured things will get tough at times. So, in today’s episode I wanted to look at a section called Jobs. And this may not be the exact copy in the book once it’s launched, but it’s a work in progress, and it is coming along. If you’d like to claim the special bonuses that come with pre-orders, you can only pre-order the book until June 30, 2017. So, I just wanted to encourage you to check it out before pre-orders close. Some creatives are not suited to jobs. This isn’t to suggest that jobs are inherently evil, or that they can’t provide you with an outlet for your creativity, but if you want to paint, you don’t need to find a job to get started. If you want to make music, you don’t need someone else’s permission. Creativity is something many people pursue outside of a job. But the reason the job question comes up is because of money. We all know we need financial resources to make our art sustainable. So what’s the answer? Do we work 9 – 5 and fund our artistic pursuits? Some do. Do we start a separate business and set aside our art until we’re free to do what we want? Some do that. Do we quit our jobs and trust that we’ll figure out the money thing later? Some do that too. And there are many other options, such as starting a freelancing career, taking chances on high-risk investments, selling your art, winning the lottery (unlikely) or cutting costs by becoming a hermit (hey, I’m not going to judge). Different approaches work for different people. But there are pros and cons to each. There are some pretty major pitfalls to some of those options too. I should know. That’s why I can’t tell you what to do. But what I can do is open your eyes to the possibilities, and encourage you to find expression for your creativity – no matter how you earn a living. I just got a call today from the guitar studio I’ve been working at since 2014. They were wondering whether or not I was going to be coming back to teach in the fall season (most studios either don’t offer lessons during the summer months, or only accommodate a few students). They already knew that I might not be coming back, but they called to confirm. Overwhelmingly, my experience with them has been good. They’ve generally been able to book a full night’s worth of students for me, the pay is good, and they’ve even provided me with additional opportunities, such as subbing for other teachers when they’re unavailable, or running the soundboard for other musicians when they come to perform at the café. For one thing, I know that the music lesson market is a bit precarious in the economy we’re in. I’ve taught guitar for over 10 years, so I’m aware that student numbers are always fluctuating. But during recessions, people tend to stop paying for “luxuries” like guitar lessons. And this will probably be the case, as long as music lessons exist. The energy I expend probably isn’t going to be worth the money I make anymore. There’s also a major time and opportunity cost. For another, I’ve been incredibly busy this year. I’ve been sustaining a freelance writing career, a music instruction career, a theatre technician career, and even a music career. Sooner or later, I knew that this would become unsustainable. The first half of 2016 was nothing but managed chaos. I knew that I wanted to pare down my commitments when I had the opportunity to, and I was even planning on doing it exactly when I’m doing it (summer 2016). There could be a tip in that. But when it comes time to say “no”, it’s still difficult, isn’t it? I’m not sure if this is universally true of creatives, but sometimes we just have trouble saying “no”, even when we should. We’re wired to pay attention to the needs of others. But the time has come for me to make decisions for me, and not just for others. I want to continue to help others, and I have a heart to serve those in need of my help, but I can’t do that without first caring for my own needs. And part of caring for me is honoring my instincts as well as my desire for personal fulfillment. Teaching has been a great experience. I’m almost certain that I will continue to teach throughout my life. But it seems unlikely that it will take the form of one-on-one lessons in cramped rooms again, at least in the foreseeable future. Some jobs will allow you to express your creativity. And if you’ve found a good one, keep it. But you’ll still need to confront this issue of monotony and repetition. Does the role provide opportunities for advancement? Do you get the chance to use all of your talents? Will you be able to work on a variety of different projects that engage, stretch and challenge you in some way? Overwhelmingly, the answer to these questions is “no”, because that’s not what a job is. 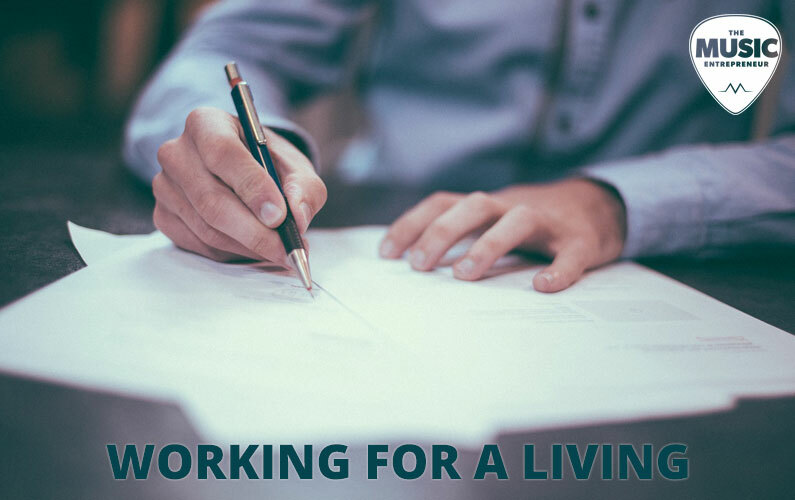 A job is just that – a place you go to do the work you were told to do and get paid to do. The vast majority of job roles and duties can be mastered in six months or less. You won’t even require the assistance of your brain after a certain point. That’s a good thing if your job is providing funding for your art. That’s a horrible thing if you’re looking for creative fulfillment from your job. And this is why creatives aren’t all suited to jobs. Now, to some extent, everything can become pretty monotonous after a while, whether it’s producing music or writing a book. Some people start businesses to achieve freedom only to create another job for themselves. Others start their freelancing careers and gain a lot of time back, but come to the realization that the thing they’re doing for others is the thing they’d much rather be doing for themselves (i.e. freelance writing… *cough*). But if you have a passion for what you do, and you get to mix things up here and there, you have a far better chance of staying engaged. When you have that kind of freedom, you also have to deal with this issue of personal discipline. Can you see yourself maximizing your time, or do you think you would waste it all on Netflix and video games? That’s another important question about structure and how much of it you need. I’ve given you a lot to think about. But let me end with this – freedom is a good goal to have, and right now I feel like I have more freedom than I’ve ever had. But retirement is a silly idea. When you have nothing to work on, you have no reason to live. And many people perish when they stop doing things. We all need a reason to live and to create. True freedom is unrestricted generosity.